Wing Chun is one of the fastest growing Martial Arts on the planet, practiced by Grandmaster Ip Man, and was Bruce Lee’s first martial arts system. Wing Chun is a combat martial arts system designed for effective self-defense fighting in any scenario. Wing Chun is known for it’s trapping hands and is based on simple principles making it effective for real street fighting. Wing Chun was practiced by the Legendary Bruce Lee. He was taught by Grandmaster Ip Man in which they have recently made new movies of his life and is becoming now more popular to the general public. Wing Chun is a highly effective fighting Art. Wing Chun is a compact martial art in it’s curriculum but yet very versatile when it comes to its applications. It’s about learning a System and start using it in its many applications. Wing Chun covers chi sau, fighting drills, lap sau, forms, wooden dummy and it’s weapons. Wing Chun Kung Fu has 3 forms. The first form being the most important where you learn your set of 108 different hand characters. As you are learning the form you are also learning how to use each hand character. Each one having its own use at a particular time and situation. The first form is the core of Wing Chun and is always going to be used in all your training as a example (chi sau, lap sau and fighting drills). In this training you develop and learn how to cover the different areas where you might get exposed. With the training your hands start developing sensitivity and they start reacting. With the practice of sticky hands in close quarters the thinking process is eliminated and your hands “learn” to react on autopilot. Wing Chun is a close quarter fighting Art. 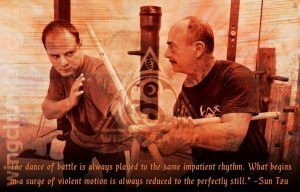 We do a lot of training on closing the gap to the Wing Chun range “close quarter fighting”. As we do this we use principle such as covering as we close in the gap. This type of training develops a reaction and confidence in the practitioner to actually know and be able to cover and close in the distance. Wing Chun is a highly effective martial arts system. Here are some highlights that show what it has to offer.